Liviu C. Suciu at Fantasy Book Critic has published the first review of Avempartha, and while I could not be more pleased with his write-up, I hesitate to send those of you who haven’t read the book there, as he does give away a few minor spoilers, which to his credit he clearly announces. Mr. Suciu has done very well by me. He was one of the very first to review The Crown Conspiracy, and now is the first to publish a review of Avempartha. Overall, I really loved “Avempartha”. In fact, I immediately re-read “The Crown Conspiracy” the next day to try and catch any little details I might have missed the first time, and I definitely recommend reading the first book again for added depth. 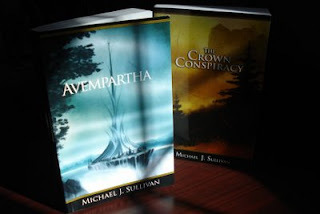 In short, “Avempartha” is highly, highly recommended and a novel that raises Michael Sullivan’s The Riyria Revelations to “major league” status.. This being the very first official response to the novel, I don’t mind saying that I counted the number of times Mr. Suciu used the word “superb” (three.) I am delighted and wish I could thank him with a post on the Fantasy Book Critic site, but that just feels like bad manners—an impolite intrusion. Critics need to be able to post what they feel without the concern that authors will comment on it. The only reason I am brining this one up here is because this is the first, and after so much anticipation, I can’t deny I am very pleased. I may soon face negative reviews, but for now, I can enjoy this one. And while the positive review is wonderful from a marketing standpoint, I am honestly most thrilled right now merely that Mr. Suciu “gets it.” I really didn’t know until now that anyone else would. Mr. Suciu, you made my day. I am pleased to report that Avempartha, the second in the Riyria Revelations series, is on time and on schedule to be released April 1st. While you might not find this surprising, after all I promised you it would be, it is in reality just short of a miracle. In fact, Avempartha is reported to be in stock and available from Amazon at this very moment. I will have a “buy page” up and running on my site www.michaelsullivan-author.com this weekend with the anticipation of books shipping out as early as Tuesday night. Avempartha is the same size as Crown, but whereas Crown had 296 pages, Avempartha has 331—a bit longer a bit heavier. There are ten “chapters” in Crown, but the publisher decided to present them as “parts” and subdivide these into chapters. Avempartha will be presented as I originally intended. There are fifteen chapters comprised of simple section breaks. Also chapter names will be more prominent than the number of the chapter. In addition, the chapter name will appear at the top of the page opposed to my name. I trust you will still be able to remember who wrote the book. Just as with Crown, I painted the cover for Avempartha. 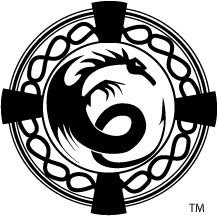 And while I am maintaining the Celtic knot tradition in the book’s design, I created a new book symbol for Avempartha. Please be considerate while waiting in those lines that wrap around the outside, and weave through the parking lots of the Amazon booksellers. Remember it is only a book and there is no reason to fight your way to the door. It is still very cold in many regions above the equator so if you plan to spend the night of March 31st in line please dress appropriately. Bring thermoses of hot drinks and use down-filled sleeping bags not the cloth ones, and place mats or even cardboard underneath if you are on cement. Keep in mind that Amazon is not accustomed to having long lines stretching out their doors so remember to watch for, and avoid blocking traffic. If the lines stretch into busy roads remember to wear bright colored clothing, or better yet, reflecting vests. Police have already announced they will not allow lines to block streets consisting of four lanes or more. Those who get in first, please don’t taunt the others in line, that is cruel and could lead to violence. For this same reason, Amazon and local law enforcement are requesting that customer do not bring swords or daggers with them. Also, remember the fifty-book-limit policy. It is there so everyone has a chance. How would you feel if you waited eighteen hours in line only to be turned away steps from the counter? Re-selling on the grounds of the Amazon stores will not be tolerated. Amazon officials—dressed in uniform and undercover—will be patrolling the lines. I have heard that Amazon does not have a problem with selling places in line. In the event news crews arrive at your branch of Amazon, please act dignified in your interviews. It not only hurts the fantasy genre, but literary fanatics in general if you act like movie, music or techy geeks. When you get your books home, keep them in a cool, dry place. It isn’t necessary, or advisable to sleep with them as you might roll over and crush them. And remember that Avempartha, like all my books, are best read slowly to savor each word and soak up the moment because the next one won’t be released for six more months. Behold, a preview of the book—a photo of the first ever proof of Avempartha—the only one of its kind in the world. The last two weeks have been like cramming for finals. After receiving the edited version of Avempartha back from the publisher, Robin and I proofed it ourselves and found a number of errors as well as numerous needed edits. When you are proofing a book you wrote for final publication, this sort of thing drives you nuts. Oscar Wilde once said; "I have spent most of the day putting in a comma and the rest of the day taking it out." This about sums up the final proofing stage. The English language, while governed by rules, is often vague and capricious about those rules. As a living language, it is based on what is most commonly spoken and as such, the rules can change. What is written also alters the language-scape as well. Shakespeare invented scores of new words that became part of the common language such as: antipathy, critical, frugal, dwindle, extract, horrid, hereditary, excellent, eventful, barefaced, assassination, lonely, leapfrog, indistinguishable, and zany, not to mention a host of words that never before had the prefix “un” in front of them such as unmask. More recently J.K. Rowling’s “muggle” and “Quiditch” entered the dictionary. Writers frequently and intentionally break the rules of grammar as well. Most authors consider the “complete sentence” rule more of a guideline. Cormac McCarthy refused to even use quotes and commas in his prize-winning novel, The Road. I’ve read Avempartha three times in two weeks, and I’m not a fast reader. The house looks like a dorm room with empty pizza boxes and dead cans of soda. With both Robin and I killing ourselves to get this release out as close to on-time as possible we’ve done nothing but work on it. I edit text in my dreams now. I edit my own thoughts. I have actually edited other people’s verbal speech. “You know you don’t need to use the word ‘and’ twice in that sentence.” People look at you strangely when you do that. So what am I doing wasting time writing this blog? The final proof of Avempartha was approved and released for printing yesterday. Now comes the hush before the storm. The nervous waiting. The period of anxiety before the first reviews. Nothing to do now but cross my fingers and hope. The economic downturn has thrown up a last minute hurdle in the release of Avempartha. My publisher recently announced the shocking news that economic downturns and tightening credit lines put them in a difficult cash flow situation. Despite having already invested thousands in the production of the book, they would not be able to print Avempartha. You can imagine my dismay considering that I was also informed that Avempartha already had a large number of pre-orders. Just when my books looked to be picking up momentum, I would have to tell my readers that the series I promised them was going on an indefinite hold. The publisher was very apologetic, but there was nothing they could do. By the terms of the contract I signed, AMI had until October to put the book into print before they were in violation of the terms. So I would have to wait until this fall to begin the process of getting the rights to Avempartha back and who knows how long it would take to put the book out then. All the pre-orders would be canceled, all the reviews that Robin was able to line up would vanish, all the book clubs who scheduled to read Avempartha would take the novel off their line-ups, and all the bookstores who had signings scheduled would cancel. And who knows how many of my fledging fan-base I would disappoint—I would fail to deliver on my very first promise to them. Avempartha had been scheduled to be released on April Fool's Day, and the joke wasn’t funny. Over the last few weeks Robin and I negotiated with our publisher to find a way to re-gain the rights to Avempartha immediately. The publisher has already invested substantial money into the book for editors, proofers, layout, advertising, and distribution, and so was unwilling to merely cancel the contract. I am now happy to report that I have reached an agreement with AMI allowing me to regain the rights and release Avempartha immediately. I am even more pleased to report that Avempartha will be released on schedule (or at least darn close) under the Ridan Publishing brand. Aside from a month of stress and long hours getting the book out the door, the only other hiccup is that those of you who pre-ordered Avempartha will have your orders canceled because the book’s ISBN number has changed. The good news is you can still pre-order, but need to use the new ISBN. So use this link and just re-order. At this time, I think we will hit April 1, if not then very close to it—only delayed by a week or so. I regret the inconvenience, but am happy the book is still coming out. So for now I will be printing/selling the books myself, but I'm actively looking for a new publisher though this may take some time. If you have any questions please feel free to ask. It has happened more than once now, people asking me what my daily routine is. This question invariably comes from other writers—aspiring writers. I understand it. I’m curious too. There is a sense of wondering if you’re doing it right. There’s no writing boot-camp where a drill sergeant teaches you to rise before dawn and field-clean a Word doc in under eight minutes. There are legends of course, like any mysterious, romanticized profession—and let’s face it, a profession done alone and in secret that invents people and even new worlds, is pretty mysterious. The best legends are drawn from the likes of Hemingway and Fitzgerald, hanging out at coffee shops in Paris, or the Inklings meeting on Tuesday nights at the Eagle and Child pub in Oxford to read aloud their newest works. Some people don’t care about where, when, or how they work. My wife, for example, is very utilitarian and can work in a cluttered laundry room with the television blaring in the next room and be just fine. I tend to be an idealist—one of those people who embrace the atmosphere as much as the work. How I live my life is just as important to me as what I do with it, and I tend to embrace the traditional cliché. If I go to an Irish pub, I don’t want to drink Budweiser and watch basketball on a flat screen; I want to drink a pint of Guinness and play a game of darts. If I go on a picnic, I want a basket and a checkered cloth. So while I have written in less than perfect circumstances, I do make an effort to imbued my writing life with the ideals of writing. I don’t wear a tweed jacket with suede patches, (usually jeans and a t-shirt), but I do have an “office” or “den” if you prefer, with a door I can close. As you can see, I line the place with books and dark woods. I’d love to have a fieldstone fireplace and a secret door behind a built-in bookcase, but one does have to make concessions. I use a computer to write—an IBM laptop that I plug into a keyboard and monitor at my desk. Some writers insist on the virtues of handwriting and then transcribing into text, but personally, I’ve never understood that since I think far faster than I can type and I write by hand at a snail’s pace if I want to be able to read it later. The hand-writers would claim that this is the very point of using a pen—to slow down, but I find that creativity comes in deluges and if the pipe is too small to accommodate the flow, much is lost. The only time I use a pen is in my notebook when I am jotting down notes I want to remember. Usually this is done when I don’t have access to my computer—I almost always carry a little Molskine notebook with me just in case inspiration strikes. I use MS Word (2007.) I used 2003 until just recently, being reluctant to change tools. I also use WordWeb, a free downloadable application that I find indispensable as it allows me to ctrl+right click any word (regardless what program I am using) and instantly bring up a dictionary and thesaurus on that word. Add to these, the Firefox web browser, and you have all the tools I use on a regular basis. My average “writing day” then begins first thing in the morning. By eight AM, the kids are off to school, my wife to work, and I am left alone in a quiet house with my dog, Toby. I make a pot of coffee from a special mix of decaf and caf, which I have over the years determined to suit my metabolism. I drink perhaps four cups of strong, black coffee over the course of the morning as I write and if it were full strength, I’d probably have a heart-attack. I settle in at my desk, with my coffee and my dog at my feet and check email. By nine, it is time to dig in. I have a playlist on iTunes and a radio station on Pandora both of which are called “writing music.” Fact is, I can’t read or write if someone is singing. The lyrics interfere as I start listening to them. It is like trying to compose a sentence while someone is speaking to you. Still, dead silence is dreadful. Music, I found, greases the skids. Emotional, dramatic, or soft and soothing, music can evoke a mindset for creating. The best I found for this are movie scores. Not soundtracks mind you, not a compilation of songs, but the theatrical, background scores, the music you usually don’t consciously hear in a movie. I find it works the same way while writing. So with the music playing, and my dog resting on my feet (Toby is an American Fox hound we rescued from a shelter last year), I begin by re-reading the last page or so of what I wrote the day before. I edit it as I read and this gets me in the mood to write, it also refreshes my memory of where I was, the flow and the pace and when I hit the blank edge of the last line, I know just where to go next. So far, I have never had writer’s block. Someone asked me that recently as well. I’m not even sure what that is exactly. Does that mean not having an idea to write about, or locking up in the middle of a project? Perhaps it means both. I have had it where I was stalled while I searched for the solution to a logic problem, but that usually only lasts a matter of hours a day or two at the most. 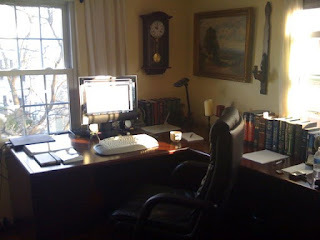 I write until noon or one, then I stop for lunch. I eat alone in my dining room where I read a textbook on history. I only read it when I eat as it lays open so nicely and eating alone demands something to read. I usually only read a page or two each day, but I have managed to read several massive textbooks this way. If the day is nice, I usually head outside after lunch. I take Toby for a walk in the woods, or ride my bike on the trails, or (if it is spring) I will set up my easel on the patio and paint oil on canvas. I only paint outside, and by July the misquotes make it impossible. The family returns near dinnertime, which I cook—stews, roasts and soups in winter, and lots of grilling in the summer. After dinner I might write for an hour or so more, then I read until I’m too tired to keep my eyes open, then turn out the light. As mentioned, this is a “writing day” and days vary greatly. With the launch of my first book, I haven’t had many writing days. Most of my time is spent in promotion or editing. The desire to create is gnawing at me, but with the release of Avempartha only weeks away, there is little chance I will have the luxury of enjoying many writing days in the near future. I have this idea in my head that if I push hard now and manage to succeed enough to gain a following, then I can return to writing and let the momentum carry me. I have a sneaking suspicion that this is a lie. Something tells me that the need to promote never ends. Luckily, all the books in this series are done, or I’d be panicking right now. after visiting this, I found it fascinating how many writers choose to write in the mornings and not at all after that. Here I thought I was just strange. Do you write? When, where and how do you do it? I have always lamented the lack of respect the fantasy genre receives. Now it doesn’t seem to matter what genre an author writes in, they all complain about how little respect their literary form gets. I recall Stephen King mentioning how maligned the “Horror” field was and recently a thriller writer I know bemoaned the lack of respect his writing category garnered. As I thought about it, none of the genres are respected. Sci-fi, Romance, Thrillers, Mysteries, Horror, Adventure…they all are denounced. Fantasy however, is the ugly stepsister to the ugly stepsister. It doesn’t even have its own section in a bookstore. I have yet to walk into a Barnes and Noble or Borders and see a fantasy section. The best that can be hoped for is a “Science Fiction/Fantasy” section. I personally feel there is a huge difference between Sci-Fi and Fantasy, but one could argue that Sci-Fi and Fantasy are both part of Speculative Fiction and this is why they share shelves, but Horror is also Speculative Fiction and yet it manages to have its own section. Given the recent upsurge in fantasy’s popularity, with such successes as Harry Potter and the Lord of the Rings books and films, I would have thought it could have earned its own distinction, but so far, nothing. I find this a strange rebuke given the distinguished history of the fantasy genre. Recently I was asked to give a talk on this very subject (more or less) for a writers group, which caused me to take what I already knew and add research to it. What I learned was interesting enough that I thought I would share it here. Fantasy is the oldest form of literature. The ancient Sumerian Legend of Gilgamesh, suspected of being the first literary work of fiction, is a fantasy tale. The story of a hero-king who goes on amazing adventures with his half-wild friend Enkidu, follows the genre standard fairly well. While it abounds with myths, so do most modern fantasies. Following this auspicious beginning, we find such works as Beowulf and Homer’s Odyssey displaying the classic fantasy precept: “a hero with a destiny, on a quest against fantastical, often supernatural, adversaries.” Then as social constraints tightened, fantasy used allegory to say what couldn’t be so easily spoken of as in Dante’s Divine Comedy and Swift’s Gulliver’s Travels, and more recently a means of conveying a complex idea through parable or fable such as George Orwell’s Animal Farm. Oddly enough, you won’t find any of these books in the Science Fiction/Fantasy section of your local bookstore, and yet each one is pure fantasy. Of course, the modern age of fantasy began in the 1800’s with the three: George MacDonald, William Morris, and Lord Dunsany. MacDonald was the first to write fantasy for adults saying, "I write, not for children, but for the child-like, whether they be of five, or fifty, or seventy-five." His stories concern themselves with people from reality entering into a fictitious world similar to Alice in Wonderland that came not too much later. Morris took it a step farther, having the whole story take place in a completely separate invented world. Dunsany (his real name being Edward Plunkett), established the genre in both novel and short story form. Despite Morris and Dunsany using ancient Norse style myths, such as dwarves and magic swords, the fantasy genre was dominated through the turn-of-the-century by wild adventure stories such as King Solomon’s Mines by H. Rider Haggard, (1885) writing in response to Treasure Island which he considered “over-rated”, Rudyard Kipling (Jungle Book), and Edgar Rice Burroughs (Tarzan) 1912. What today we consider fantasy was still trapped in the realm of Juvenile fiction with works like Wizard of Oz and Peter Pan. It wasn’t until the twenties with the publication of the first all-fantasy fiction magazine, Weird Tales created in 1923 that popularity for the genre took hold. Other magazines followed and launched the careers of writers like H.P. Lovecraft, Robert E. Howard (Conan), Fritz Lieber (Fafhrd and the Gray Mouser). This pulp fiction format brought fantasy, as a serious genre, to wide audiences in the U.S. and Britain. Then came the Inklings, most notably J.R.R. Tolkien and C. S. Lewis who reached back and tapped into the ideas of Morris and MacDonald respectively and created The Lord of the Rings and The Narnia Chronicles, stories of swords and wizards, dwarves and elves, destiny and good versus evil. While they were reasonably well-received at the time of publication, between the thirties and mid-fifties, it really wasn’t until the paperback publication of the Lord of the Rings in the sixties, that the fantasy genre really took off. Science Fiction had already been popular through the fifties, but as the popularity of fantasy grew across college campuses, some science fiction writers began to turn to fantasy. Lin Carter and Ursula LeGuin for examples transitioned and I suspect this may be why fantasy was, from then on, stuffed in with the more established Sci-Fi books and seen as being of the same kin. Still it wasn’t until 1977 when Terry Brooks published the Sword of Shannara—the first to appear on the New York Times Bestseller’s List—that it was proven someone, whose name wasn’t Tolkien, could succeed in fantasy. In the eighties came the ongoing series phenomenon with the likes of David Eddings and in the nineties came the “fat-books” as epitomized by the likes of Robert Jordan and Terry Goodkind. This became entrenched as the tradition of fantasy. The long, dense books of world-building, of endless series that ended in cliffhangers, of unpronounceable names and archaic dry prose. For traditionalists, these are wonderful books, only as the nineties ended a new audience was discovering fantasy. As the century turned again, a new revolution appears to be taking shape in the fantasy industry. New, unconventional, writers are popping up and fans are embracing them. Writers like Brandon Sanderson, Suzanna Clarke and Patrick Rothfuss who defy the traditions and push the boundaries are finding more than just acceptance, they are finding thirsty readers, parched from a long drought of sameness. It does not surprise me that a young adult book such as Harry Potter appears to have precipitated this change. After all, the revolution of Tolkien, which established the benchmark of fantasy, also began with a young adult novel—The Hobbit.